A knee, leg or foot injury, whether you are a maritime worker or a passenger, can affect your entire life. For many months you may not be able to walk without assistance; you may not be able to work, and you may have months of physical therapy. Many times, a knee, leg or foot injury can also prevent you from returning to work, making it difficult to support your family and pay your medical expenses. These types of injuries are very painful, but worse still, for many people, losing the use of their lower extremities can mean losing any ability to financially support themselves and their families. 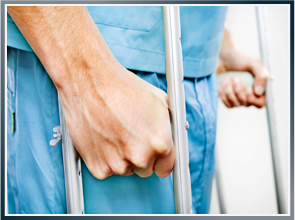 If you suffered a knee, leg or foot injury while working on any type of ship or boat or while a passenger on a vessel, a maritime attorney from Latti & Anderson LLP can help you recover damages including medical bills, past and future lost wages, impairment of earning capacity, past and future pain and suffering, mental anguish, physical disfigurement and other costs. In many lower extremity injuries, the individual may require future surgery to remove hardware from broken bones, or he or she might need a hip, ankle or knee replacement. There also may be extensive physical therapy to help the person recover to their pre-injury state. Lower extremities injuries generally affect the ability of the merchant seaman or fisherman to return to work. Many times, due to the injury, the fisherman or merchant seaman is no longer able to go back out to sea and perform a watch or work for 10-12 hours a day climbing ladders and working on uneven surfaces. As a result, damages may consist of past lost wages, future lost wages and/or impairment of earning capacity if you cannot return to your former occupation or if you cannot work at all. Damages may also include past and future pain and suffering, mental anguish and physical disfigurement. An injury to a maritime worker’s knee, leg or foot can cause a lifetime of pain and suffering, but our maritime and Jones Act lawyers can help those who were hurt because of negligence, lack of training or unsafe conditions aboard a vessel. For more than 50 years, Latti & Anderson LLP has been winning multiple verdicts and settlements exceeding $1 million. We have represented numerous fishermen, servicemen and ship workers all over the world. If you have suffered a knee, leg or foot injury at sea, contact our maritime trial lawyers today and set up an appointment. We serve clients nationwide.